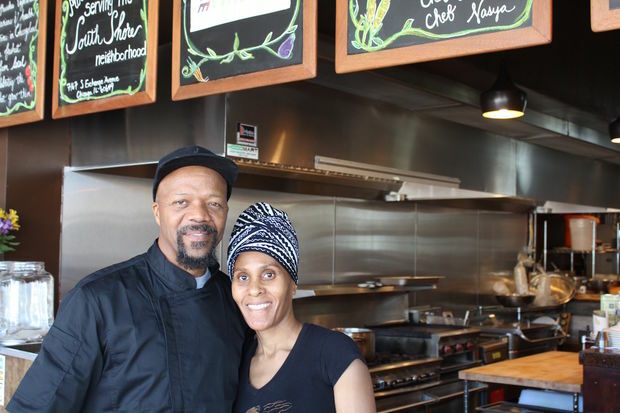 SOUTH SHORE — Majani, a new vegetarian restaurant, has opened after literally costing owners Tsadakeeyah and Nasya Emmanuel their last dime. The restaurant at 7167 S. Exchange Ave. adds to a growing number of chefs specializing in vegan and vegetarian food setting down roots in South Shore while other chefs have passed the neighborhood by. Emmanuel said the restaurant has taken two years to open, and he had to scramble to raise enough cash to stock the produce necessary for the first day. “We sunk in our last dime, literally,” Emmanuel. It’s a big bet for Emmanuel and his wife, but he said he’s not betting on any special affinity for vegetarian food in South Shore to be successful. He said there are enough people in South Shore that if just 5 percent eat a vegetarian diet and more are more want a healthy meal he can be successful. “Most of our customers aren’t vegan; they just want to eat healthy a couple days a week,” Emmanuel said. So far, he appears to be right. He said the restaurant was packed its first week and has had a steady stream of customers going into its second week. Emmanuel’s take on a vegetarian menu comes from a childhood raised in a home that didn’t eat meat as part of religious observations, mixed with an interest in exploring the range of flavors within the African diaspora. “This is how I eat, and I just wanted to share that,” Emmanuel said. The menu mixes flavors like Jamaican jerk seasoning with the ingredients of Southern American or Ethiopian techniques into recipes honed over the last six years of catering events. Emmanuel said he’s been trying to open his own restaurant since at least 2006, and he has put in the effort with the current location since getting his lease two years ago and starting to navigate a nine-month permitting process and just as long renovating the building. The ceiling’s tin tiles were all meticulously cleaned and repainted and reinstalled with custom woodwork to fill in the gaps. The tables were all built by hand. And it was all done largely by Emmanuel himself, down to the tuckpointing on the exposed brick wall. That ability to do it all may serve Emmanuel if this first location is successful and his plans to expand to Englewood and the West Side gain steam. “I want to focus on areas that don’t have healthy eating options,” Emmanuel said. He said his dream is to include a bakery and shared kitchen to help other caterers and restaurants get started. For now, Majani joins Good Food vegetarian deli, a planned bakery from vegan baker Betty Bot, Chef Sara’s Kitchen and the Healthy Food Hub produce buyers club in an expanding number of healthy food options in South Shore. All, including Majani, are run by South Shore residents.